Flash is great entertainment for every user group and brings operators not only closer to the olympics but adds an exciting game for sports and competition oriented audiences. A level-creator will appeal to groups and enhance the social experience, add an element of creativity and enhance repeatability. It is packed with stunning graphics and sounds that mesmerise both players and audiences in a unique setting. Tic-tac… the clock is ticking. Players can be creative, figure out moves and beat the speed record. 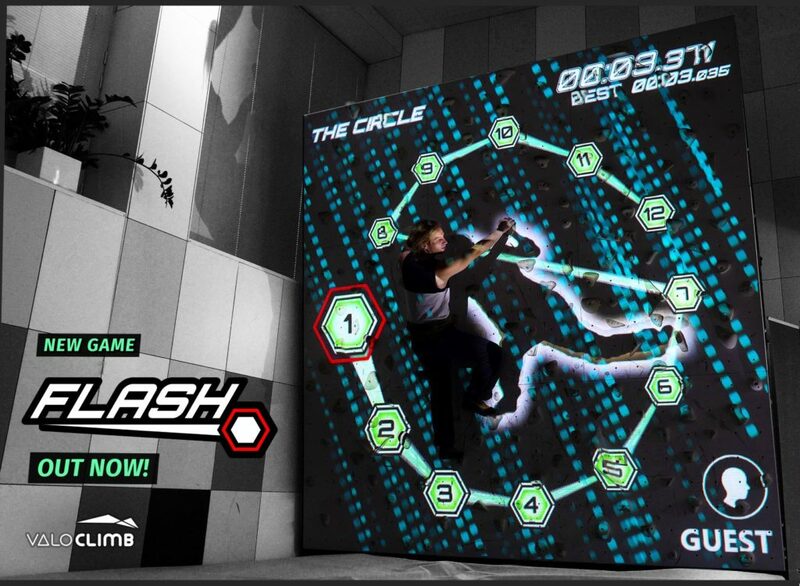 Start the level, hit all the touch-points and see – did you beat the time? Play it by yourself or in group. Take turns, fine tune your sequence of moves. Compete with your best styles and strategies. Can you find the ultimate formula on next try and find fame in the online high score? With Flash players will discover totally new fun ways of moving on the climbing wall. A process of inventing the best climbing moves has just begun! Flash is great entertainment for every user group. Our first release comes with a package of 20 top quality levels as well as a level creator.